It has been a good 4 years since I last flew with British Airways in World Traveller Plus, aka Premium Economy, on a long haul journey. I pretty much do everything I can in order to fly in Business Class (Club World), or even First (but possibly just a couple of times a year), but this time it wasn’t meant to be (or planned). Nonetheless, I was quite excited (or kept telling myself ‘it was OK’) – for one single reason: I was to fly in the new A380, which had been on its maiden voyage under two weeks before. 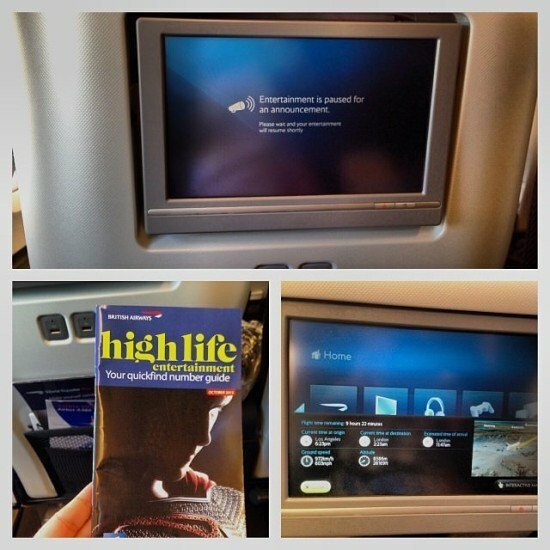 Here’s how my Los Angeles – London Heathrow flight went. All flights from LAX depart from the Tom Bradley International Terminal. As a British Airways Gold Executive Club card holder (OneWorld Emerald), I get to check-in at any First counter, which is a lovely perk, irrespective of the class I fly. There was one passenger being served and as soon as he was done, we were next. Wait time: 3 minutes. Check-in was efficient and the lady who helped us was lovely and was really quite excited about the A380 – ‘do you know it is ‘the flight’ to get from LA, right? It is the new plane!’. I did indeed and that is why we booked this flight (and 500 of our closest friends). ‘Any chance we could have an upgrade?’, I asked. ‘I am sorry madam, but the flight is fully booked’. Worth a try, anyway! We used the fast-track lane at the terminal, which is a little bit of a joke as it only fast tracks you to the TSA agent checking your boarding pass and passport. You then merge with everyone else. Sadly, out of 6 lanes, only 2 were open – and I promise you, there must have been more than 20 agents manning them (or just walking around). British Airways passengers use the OneWorld lounge which is located close to the security area. There are two lounges to use: Business (for Business Class, OneWorld Sapphire and BA Silver cardholders) and First (for First, OneWorld Emerald and BA Gold cardholders). We went into the latter for obvious reasons and got ‘the bonus’: a bit of celeb spotting. I never see anyone in my life (seriously), except on this lounge – and worry not, I behaved impeccably (it was so hard – think: cool band, lead singer, absolutely gorgeous and tall). This lounge is quite nice (obviously not like BA’s lounges back at Heathrow) and the food selection was decent, for US standards – we had beef, pasta, vegetables, real cheese (wow) and some yummy cookies. The drinks selection was rather weird, but still with good wine but no champagne (only sparkling wine) and no ‘normal gin’ (only Bombay Dry). 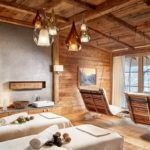 The restroom facilities were very good and the wi-fi was also working well – however, not enough power sockets, which made everyone move sofas in order to find some. The magazine selection was poor but the newspapers were quite good – both US and UK. – Welcome – we boarded the plane using the fast-track lane and took the escalators up to the 1st floor of the plane, where the World Traveller Plus (Premium Economy) cabin is located. The A380 has two floors and you board directly to your designated area, so it is no different from a normal sized plane. Once on board, we were greeted by name ‘Welcome back, Mr. and Mrs. O’Reilly’, which is a nice touch if the crew member can spot your frequent flyer status. When we sat down, we were offered a glass of champagne or water, which surprised me – but obviously I didn’t say no. (I believe it was sparkling wine, and a very nice touch in this cabin – on the outbound flight the options were orange juice or water). Getting in the mood, yes please! – Amenities – on our seats, we found a pillow (loved the colour: it was grey! ), a blanket and noise cancelling headphones. 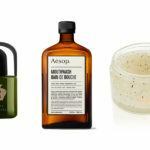 Weirdly, we did not have the little overnight amenity bag, which usually contains socks, eye-mask, ear plugs, toothbrush and paste and, guess what, a pen. I have only gotten a pen when I travelled on this cabin, years ago (and quite a few times since it has been introduced), which I find very handy. I actually asked the crew where this was, later on the flight, to be told that they weren’t loaded by the ground staff, which I found quite strange. I was asked if I needed anything, which she would get from another cabin and I requested a pair of Club earplugs (the best in the world, which I use on a daily basis and my friends kindly save them for me on their BA Club flights). It wasn’t a problem and the crew member was able to get them for me. – Drinks service – Prior to dinner, we had drinks and yours truly went for a G&T, as always, which was lovely. I was also given the choice to select the wine for dinner, and it was quite a moment when I asked which were the wine choices, which were ‘red or white’. I did smile (and thought it was a rather silly question as obviously I wasn’t in Club or First). I chose the red option. – In-flight dining – Things seemed promising when we were given a printed menu (I thought it was a really nice touch and wasn’t expecting it). But sadly, this was the most disappointing part of the flight (and interestingly, not so bad on the outbound flight to San Diego). There were some really good service elements – like a cloth napkin, proper cutlery, proper glasses and your own water bottle – but the way the meal was presented, with the foil covers, could seriously be improved. But in hindsight, it could have been for a reason. I wasn’t expecting foie gras or anything like that, but I was expecting a decent meal. The fillet wasn’t bad at all (if you removed the crust), and the rest was so bland, it was a real shame. Desert was as plastic as it looked. I tell you what, I was glad I ate dinner at the lounge. During the flight, the crew was very present (I was awake for most of it, by choice, worry not) and I didn’t go hungry, in case you were wondering! I loved the ice cream and the chocolates which were passed around the cabin. I may have even gone back for seconds. I missed my Club Kitchen but thought that these little touches were very good. Breakfast sadly wasn’t much better – it did look OK, but the croissant was so hard, we just gave up. I must say that on the outbound flight we had lovely scones with jam and clotted cream. I would have loved those (even if at the wrong time of the day). – In-flight entertainment – this is where I went to town. I must fly with BA over 20 times per year every year and actually think the IFE selection is usually very good. Whoever picks them does a very good job (note: thank you for Veep. I can’t watch it in the UK but every month I can catch up onboard) and on this new plane, it was almost ridiculous. Very good choices indeed and I watched 4 films and all the Veep episodes (sense the obsession). The screen was much larger than on previous planes and the sound quality is very good – you gotta love new planes. The inflight map was also much more informative than previously and I must confess I am curious with the ‘chat room’ options available – will people really take part in them? I gave it a go but I was on my own… next time! – The seat – wasn’t bad at all. The pitch is significantly wider and larger than economy and the new seats are comfortable – the headrests are way better than before. What I think could be improved? There is very little leg support – only a teeny tiny footrest which doesn’t do the job on a 12h journey at all. I know I am comparing this to a fully flat-bed, and it may not be fair, but this is where I felt most uncomfortable. The first rows have different versions and they looked slightly better. I loved the personal storage area by the window, perfect for any items you will need during the flight (so you don’t have to get up and disturb others), and also for any duty free shopping (selection is also better than ever – presence of Tanqueray Ten for £22 noted, thank you very much). Final thoughts – Although I obviously prefer Club World (who doesn’t), I think this is a very clever product, which is being extended to many other airlines as we all know. I was pleased to see many service elements which really put it halfway between standard economy and business class – a smaller cabin (now larger on the A380, usually 4 rows only) which means a bit of peace and quiet, the printed menu, a bit of bubbles (always good for the soul), a proper napkin and cutlery and the personal storage space). Service was very good – I can’t fault it in any way. Everyone smiled and tried to be helpful when needed. 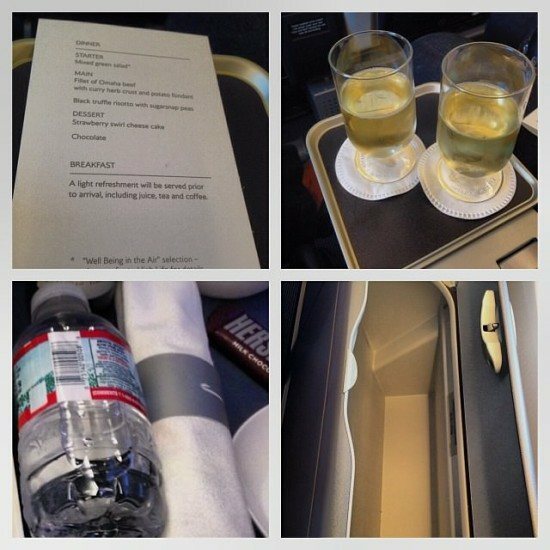 We felt welcomed and nothing was too much trouble – everything I expect from BA on any cabin, and I got it. 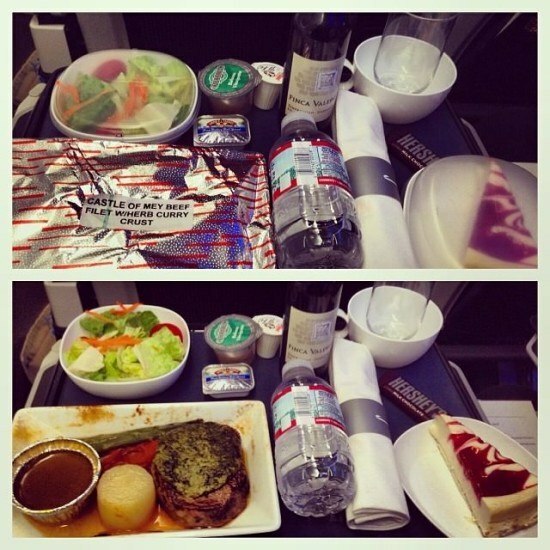 The only downfall was the food, which I have to say it was way better on the flight from London to San Diego. The plane looked fab – the cabins (all of them) looked so smart, I can’t tell you. Even the loos were much more spacious. World Traveller Plus can cost as little as £150 (each way, £300 return) on a flight from Europe to the USA – for that money, it is outstanding value, you do get what you pay for (and an extra piece of luggage, which is handy). But supply and demand change prices, as we all know, and seats can sell for more than £3,000 return. So if you usually travel in economy and fancy a treat, I would say do give premium economy a try – I did this 10 years ago and never went back. 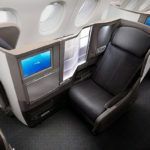 If the business cabins are shockingly expensive (as sometimes it happens – on my flight to San Diego, the difference between Premium and Business was £4,500 more, quite abnormal, but hey full plane, supply and demand! 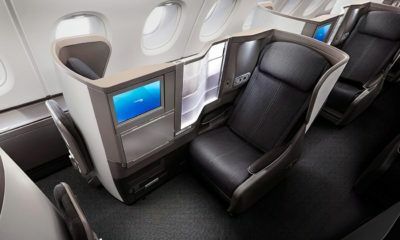 ), you will surely survive a long haul flight on this cabin. I still prefer *you know what*, but if that can’t be had every time, I will settle for this. PS. 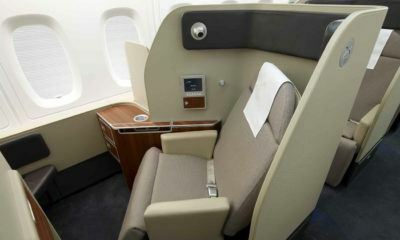 To read my review of BA‘s First and Club cabins, just click here. Thanks for the honest review. I fly business when I can get flights as an American living in the U.K. Like you once you fly premium or business you just can’t go back. I have been flying businesses but on my upcoming flight on the outbound flight I could only get premium (business on the way home) so I really appreciate the review. I appreciate the information. I too will be taking this same flight as world traveler plus. I have not been successful in upgrading to business yet, though I check each day and am hopeful. 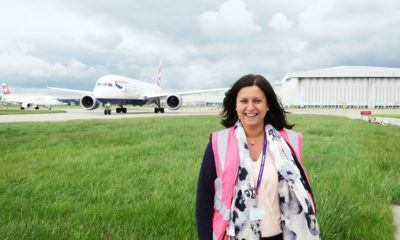 I have never flown BA long haul, are there any secrets to share for any items I could ask for that may be available? I appreciate any insight. You just need to keep checking and checking and praying a bit won’t hurt… that is the magic! I’m flying economy ba a380 to Hong Kong from he’s throw I’m 6ft 3 and will probably struggle with space so will need to walk around , I’m apprehensive of flying after a really bad flight and the longest flight I’ve had is 5hrs not 11+ , disappointed to hear that som many people complain about the more premium classes though, but I suppose if you pay the money then your entitled to your opinion but I think some people forget it’s just a metal tube and I’m sure most airlines try there best at 40000ft !!! Gary, the price you pay gives you more or less space – that is what is up for sale. Hope you have a lovely flight. And the difference, it will be a much quieter one! I have a major problem with BA. We are flying World Traveler Plus and I have severe Back, Knees, and Arthritis in my Neck and Hands, and I wear compression stockings for leaky leg valves, and to prevent DVT’s. So living in the USA, I contacted our DOT in Washington,D.C. which I found the info on the BA website. I need to sit in the Bulk Head Seat, and need my Husband in the Seat next to me, as he must help me out of my seat, help with my food tray, and various things required when we fly. Even at home or elsewhere he must help me out of a chair or seat. BA allows me to sit in 21B of the Bulkhead, but WOULD NOT ALLOW MY HUSBAND IN 21A, and put him across the aisle in 21D, and at his age of 85 he will have to be up and down to attend to me. Last year, BA sat both of us in 12A & 12B of the Bulk Head, but this year they refused, and all correspondence goes unanswered. If you call BA you talk to someone in India. Any suggestions from any of you seasoned travelers on BA? Barbara that doesn’t seem right – and makes no sense. If you book and pay for the bulkhead seats, then you should get them. All calls I have made, in the UK go to the UK – not India. I would also suggest using social media – they always respond. Another option would be maybe to contact via the travel complaints service via CN Traveler or something? For some reason the costs of last minute Club World (Business) tickets out of a Johannesburg is astronomical compared to Cape Town. 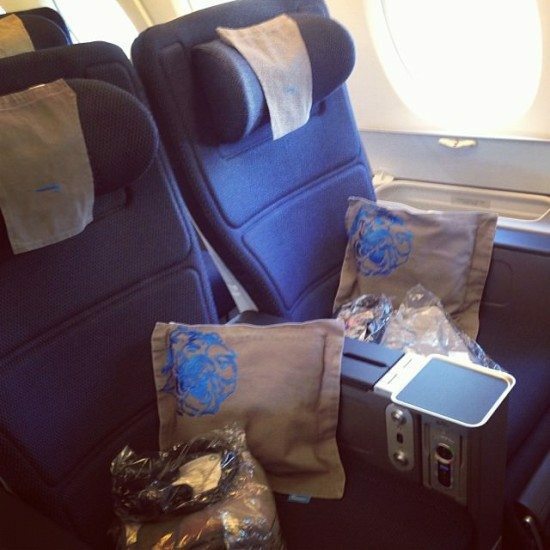 Last year I flew World Traveller Plus (Premium Economy) on one occasion on BA’s 747. It was great. Earlier this month the Club World price was also over the top and so I opted for World Traveller Plus again, this time on the A380. I was quite excited about it. Unfortunately from the very first moment I found the seat terribly uncomfortable. I did not sleep at all, and ended up with back pain. The steak that I ordered for dinner was excellent but I found that starchy mess that accompanied it to be inedible. The breakfast was yucky, and I abandoned it too. I found the seat angle uncomfortable for both mealtimes. At dinner time we had cloth serviettes and at breakfast we had paper. Try eating a sloppy breakfast at a bad angle without the benefit of a cloth serviette. Breakfast too was abandoned. None of the seat back USB ports were working in my area of the cabin. A really poor show from BA. 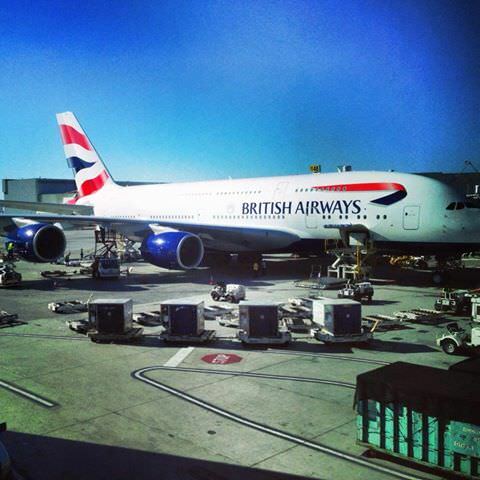 I will not fly World Traveller Plus on BA’s A380 in the future. If it is a short notice flight, I shall either go Club World, or choose business on another airline’s business class service. Hi Patrick, very interesting – I found the seats better than its predecessors and also more room. But Club sounds like a good idea, always! Can kids travel in world traveller? Yes indeed – in all classes as far as I am concerned. I still have reservations about first, though. My husband and I are due to fly to Cape Town in February WTP and brought our tickets as soon as they came out so that we could pick the seats of our choice – which we did and duly paid for. Having recently checked my booking I have found that BA have changed our seats and we are not even sitting together. BA’s response when I queried this was that in their terms and conditions they can do this – although we were never informed. They sent us a £25 shop voucher for the inconvenience. Has this happened to anyone else. Great review. I (Trevor) am planning a trip with Pat to Australia late in 2014. I have been to Australia more than 30 times before, but nearly always in Business as my company paid. I have now retired, so cannot afford £4,000 per person. I am 6 foot 7 inches tall and so Economy is almost impossible for me to tolerate. I wondered if you have any experience of Premium Economy on the flights to Australia. Also whether you have any comments about the suitability of the Premium seats for tall people. 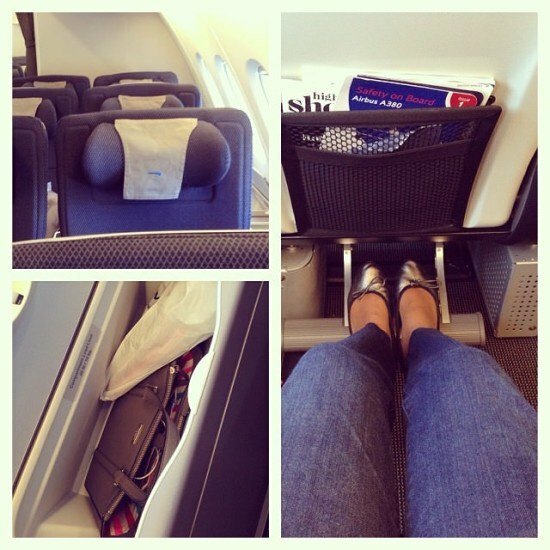 Well, premium economy is much better than economy and the extra space will certainly help if you are tall! On my fly to Oz I flew BA Business so it was my only experience, and it should be a very similar product to the one reviewed here. The printed menu is such a tease! Shame it was just that…on this occasion. I never had a bad meal onboard, but sadly this wasn’t what I expected, at all. This is so helpful. I’m working on a review of a property in Mauritius and trying to figure out how to fly to London most economically and comfortably. I have never flown BA but might in a week or so. I would definitely try them 🙂 they are good! But Club, if you can! I have tried BA WTP once and it wasn’t bad. I do prefer, like you, Club – but as you say, sometimes it is so so so expensive and corporate budgets will not allow. 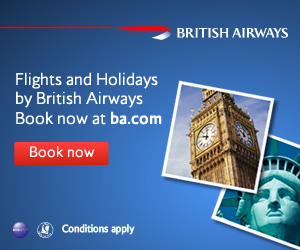 I love BA Club World – I usually travel from Paris to London so I can fly with them long haul. Air France, sadly, not really the same league. The service isn’t the same, whatever class. Very interesting point. I have never flown with Air France – maybe one day I should try! 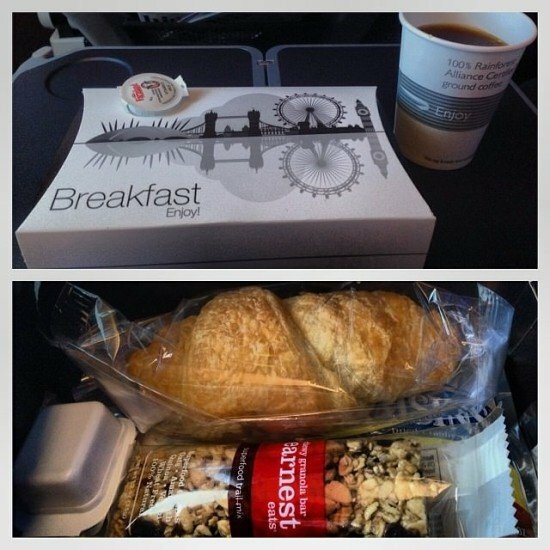 I enjoyed reading this review and what is interesting to note, as a BA Cabin Crew member is that the first meals served in Premium Economy are the same as those in Club World – although obviously a choice of 2 rather than 4. So I would put the disappointing meal down to catering out of LAX. 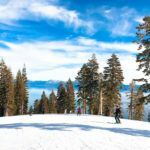 Good read – I think flying traveller+ opens up so much more of the world as way more availability as well as so much cheaper than business or cashing in miles! Have been lucky to only fly business or first long haul for the last few years, but did fly back from Singapore on the Quantus A380 – and in economy, and I’d say that had more leg room than the economy + on older models (just no socks!). Nice touch to see you still good fizz – that is a good call by BA! I know what you mean, a good compromise. But Club for me, please! flying business, premium or first is really the only way I will fly anymore.. Otherwise I feel like I am flying with the chickens. It’s rough in economy…Usually when you get to the ticket counter you can ask about upgrades and they some times have great deals. Wow, what a detailed review! Why can’t airlines figure out the food thing? And why do they make charging up in the lounge SO difficult?? 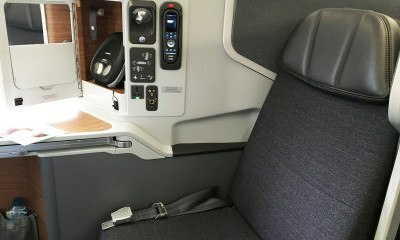 It does sound like BA offers good Premium Economy. At, Delta, the “equivalent” is basically a couple of more inches in the seat and that’s it. 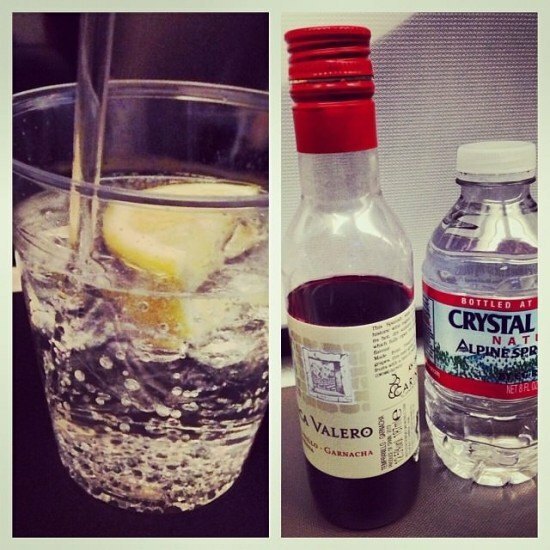 If they just gave better wine than economy, I’d be a happier -and possibly tipsier- flyer! Oh no, this is a complete separate cabin with very different service. I’ve only flown BA once, but it was nice. I tend to think any airline flown in first or premium economy will be a pleasant experience though. At least that’s been my experience. This does look pretty nice, though that meal could use some love! I usually fly economy, but I’ve been bumped up to business twice. The best experience was from Hong Kong to New York and I had a bed. I didn’t want to go back to economy ever again! Erin at The World Wanderer recently posted..Get to Know Me as I Turn Three. i’ll confess it! your flying style makes me green with envy. AND excited that i’ll soon be boarding a plane to cross the Atlantic and see YOU!!! It certainly looks WAY nicer than some stuff I’m used to on this side of the Atlantic… And how nice to fly a brand new plane, huh? And those little touches like real napkins and cutlery are certainly nice touches. Really informative article Mrs O! Being tall the extra leg room is the main reason I buy WTP!!! 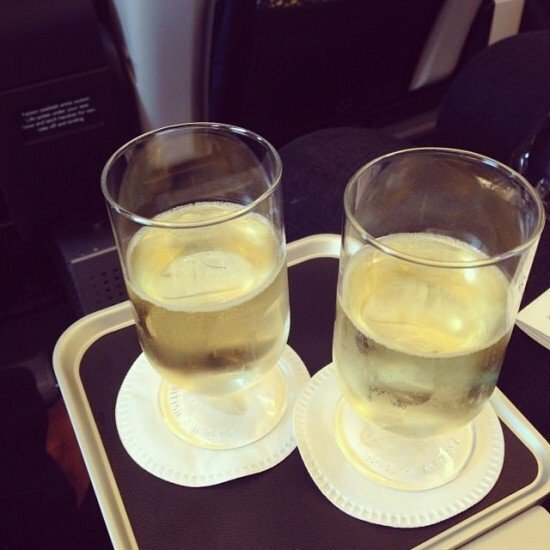 I think the champagne/sparkling wine option as a welcome on board is great – def puts you in the right frame of mind & gives you a bit of a business class service feel. Def an option for me when business class tickets out of reach for long haul. You know, I’ve always wondered exactly what ‘Premium Economy’ is, so thanks for this in-depth review, Mrs. O! I may well treat myself next time I fly economy, although it may be a while as I just booked a flight today. How exciting to fly on a brand new plane! 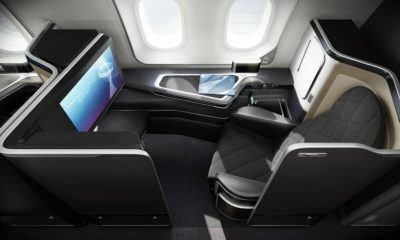 I’ve never flown business or first class, and doubt I ever will, but Premium Economy seems like something I can swing. I’d appreciate that extra personal storage space, especially traveling with kids. This offers something extra and it is a much quieter cabin. You definitely summed up my experience as well. Service was good on both of our flights from Boston to Scotland and for that I was pleased. The seats on the 777 were significantly less comfortable than on the 747 so I’m glad to hear that on the A380 they were better. In addition to a footrest on the 747, the lower part of the seat raised up, but they didn’t have this on the 777. At 5’4″, I barely reach the footrest, which led to a very uncomfortable flight back. PS – looks like the strawberry cheesecake is their dessert of the month and it was served to us in its plastic sealed container as well as the dry, stale croissant for breakfast. Let’s just say I passed on both counts! Thanks for the great review! I had to to use the restrooms. There were a lot more than I thought – must for use of both cabins. I wonder it they could ever find a set up that would keep them separate as a perk of the cabin. As I understood (I didnt go downstairs), Economy is split in both floors, so also a much smaller cabin. There was a considerable visual difference. Yeah it’s funny some airlines started off with only premium cabins on the top deck and prison class on the bottom deck! Some have changed the way they do things though not sure why. Mr 9vska might know though! 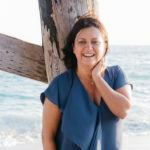 As a BA CSD who LOVES your blog ! A fab an accurate assessment and a huge thank you for you valuable and accurate opinion . I will feed this info back to the powers that be ! Thank you so much, Pierre! Thanks, Ross! Which cabin did you fly? Wonderful post – thank you! I am huge BA fan and will be getting my first taste of Club over Christmas from Vancouver to Paris. We have been flying World Traveller Plus for years and I think it is worth every penny. Thank you, Erin! You will love Club World, I am sure! Great blog and good information. Always good to know for when I make my next reservations to Europe! Excellent report, Mrs. O – thank you! You are welcome, Ben! They will be coming over the next weeks 🙂 promise!